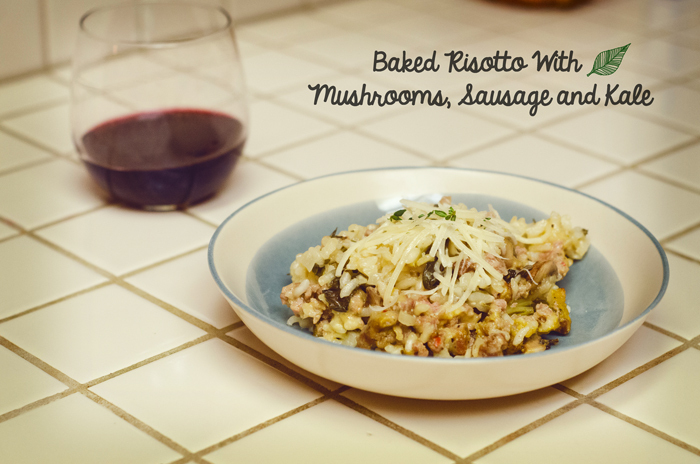 Risotto has always been a finicky and time consuming dish for me. No matter how much I dote over it, how much liquid I add, how much love I put into it, it never really tastes like that creamy bowl of wonderful that you order off of a restaurant menu. It’s fussy. I’m not so much into fussy, especially if the outcome can be kind of lackluster. I had written myself off as the kind of gal that would not make a risotto. It’s fine. I’ll make pasta. 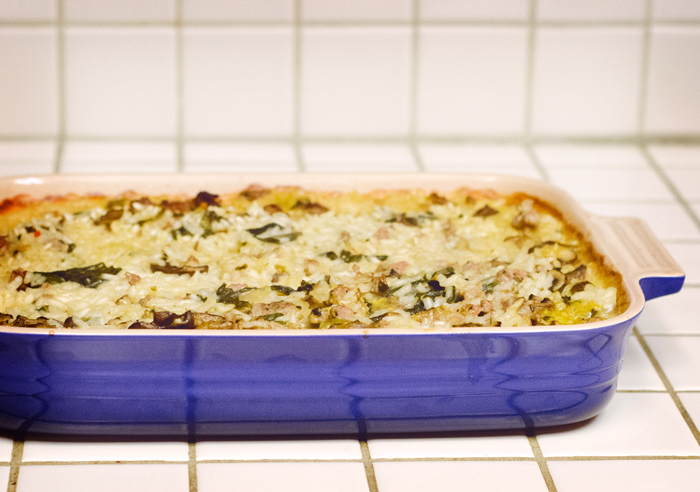 I originally made Joy’s recipe for a dinner party that I threw with my friend Becca. I was skeptical. What do you mean I don’t have to stir this? No embarrassing sweat-stache as I stir and stir and stir? I must be dreaming. Sure enough, it worked, and it was a hot hit. It might be a little intense to say that this changed my life, but that’s how I roll… a little intense. It was life changing. I CAN be that gal that makes risotto. I knew for sure that I wanted to do this again, and this time add some really savory flavors to compliment the changing seasons. I substituted the water in the recipe for white wine, and made that rice good and drunk. I also added earthy mushrooms, a lemon, sage-flavored sausage and plenty of kale. I knew it was a hit when my husband (while eating his first piece) asked me when I planned to make this again. Always a good sign. Go forth. Relax your stirring arm. No fuss. In a medium-sized skillet, heat up your olive oil. Add in your chopped-up onions and your garlic. Saute them together until your onion becomes nice and translucent. When the onions are translucent, add in your sausage. Brown your sausage until no pink remains. Add in your mushrooms and your kale and saute until all of the kale is wilted. Add in some black pepper and a pinch of salt, whatever suits your taste. Set the mixture aside. In a separate bowl, mix together your uncooked rice, cheese and the sausage mixture. Butter your baking dish (I used a 9 x 13). Place this new rice mixture into the baking dish and spread out evenly. Pour the stock and the water evenly over the rice mixture. 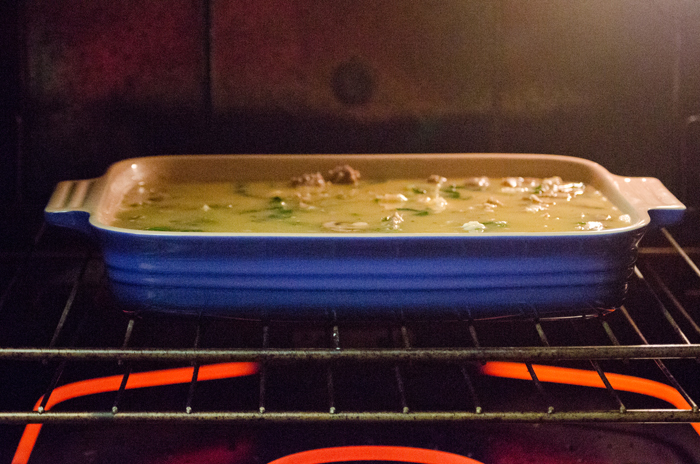 Place the dish into the oven on the middle rack. Cook uncovered for 37-40 minutes. Kick your feet up and wait for the magic. Have some wine. Catch up on the current 12 “Words with Friends” games that you are playing with your Grandma. Did I mention watching some Creek? Or, be productive and make a salad. Steam some broccoli. The choice is yours. Make sure to stir it once (around the 20 minute mark) and then pop it back into the oven. When the rice is done, all the liquid will be absorbed, and it should have a creamy texture. If you feel your rice is still a bit crunchy, you can add more liquid in small increments (1/3 cup or so at a time) and cook until it is all absorbed. When all of the liquid has absorbed, and you feel it has cooked through to your liking, remove the dish from the oven and allow to cool for 15 minutes. After that, serve it up. Add some parmesan, salt, pepper, thyme…make it your own. Enjoy. It is said to last up to 5 days in the fridge in an airtight container. Don’t worry though, it won’t last that long.